← How Often Does the Pope Change Canon Law? Why Doesn’t the Church Publish Marriage Banns Any More? A: Brian has a point! Older readers probably grew up with the routine announcement of the banns of marriage at Sunday Masses, while many younger readers may have absolutely no idea what we’re talking about. Let’s take a look at the original purpose of marriage banns, and then we’ll be able to see why current praxis in many parts of the world differs from the past. Legislation regarding the banns of marriage is located today in a subsection of the code entitled, “Pastoral Care and the Prerequisites for the Celebration of Marriage.” It’s pretty easy to appreciate that when a couple decide to get married, they first have to sit down with the parish priest and show him that, as canon 1066 puts it, nothing stands in the way of the valid and licit celebration of the sacrament. (See “Why Can a Parish Priest Annul This Marriage?” for more on the pre-nuptial investigation required by canon 1066; and “Are They Really Catholic? Part II” for a discussion of the terms validity and liceity.) Among other things, each prospective spouse has to show that he/she is old enough to marry—16 for the husband, and 14 for the wife—since otherwise the marriage will be invalid due to the impediment of age (c. 1083; see “Can a Catholic Ever Elope?” for more on this particular impediment). They have to show also that they are both baptized Christians; if one party is not, the impediment of disparity of cult exists and, as we saw in “Marriage Between a Catholic and a Non-Catholic,” a dispensation from that impediment will have to be requested from the bishop (c. 1086.1). While the parish priest may generally presume the good-will and honesty of the prospective spouses, there are times when unfortunately, one party may perhaps be anxious to hide some factor which could affect the validity of the marriage. In such cases, publicizing in advance the couple’s plans to marry can force such issues to come to light. To take an obvious example, let’s pretend that George and Elizabeth are planning to get married. George has never mentioned, though, that when he was a soldier stationed hundreds of miles away in years gone by, he married a local girl and that marriage has never been annulled. He is obviously unable to marry Elizabeth validly, because of the impediment of prior bond (c. 1085.1). Poor Elizabeth has no idea, and the pastor of the parish is just as ignorant of this critical information as she is. True, the couple have provided the priest with copies of their baptismal certificates, and a notation about George’s marriage should be written on his; but as we saw in “Canon Law and Marriage Records,” it sometimes happens that parish priests fail to add these crucial remarks to the baptismal records of their parishioners. This is where the publication of marriage banns fits into the equation. Let’s say that George’s military buddies know all about his marriage, but nowadays they don’t keep in touch too much, and George hasn’t breathed a word to them about his plans with Elizabeth. But now the parish priest publicly announces the planned wedding of Elizabeth and George—and one of his old friends happens to hear about it. He can come forward and warn the priest (and George’s fiancée) that George is actually married already to someone else! Thus the banns of marriage have always served a very practical purpose. They inform the public of the upcoming wedding, and if anyone knows of a reason why the marriage should not or cannot take place, he can come forward. As awkward as doing so may be, it’s certainly better to prevent an invalid wedding ceremony in advance, than to leave the spouses to deal with undoubtedly painful fallout at some future date, when the true facts finally become known. Fairly detailed instructions regarding the publication of marriage banns were found in the 1917 Code of Canon Law, which was abrogated by the current code in 1983 (see “Are Women Required to Cover Their Heads in Church?” for more on these two Codes of Canon Law). In the past, the pastor of the parish was required to announce upcoming weddings (c. 1022); these announcements were to be made on three consecutive Sundays/Holydays of Obligation, either at Mass or at some other liturgical event which the people frequently attended (c. 1024); alternately the priest could be permitted to hang a written notice at the doors of the parish church for eight days, a period which had to include two Sundays/Holydays of Obligation (c. 1025). But none of these laws is contained in the current code. Instead, canon 1067 says simply that the Episcopal Conference is to establish norms regarding the publication of marriage banns, or other appropriate means of inquiry. (See “Are Catholics Supposed to Abstain from Meat Every Friday?” for more on what an Episcopal Conference is.) This means that nowadays, Catholics in different regions of the world have their own specific rules on the means to be used to ascertain that a prospective husband and wife are indeed free to marry in the Church. If you think about it, this change in the law reflects the changes in modern society. In general, the people of previous generations were more likely to stay put in the same diocese all their lives, and so more or less everybody knew each other. Publicizing the marriage banns made sense, because if a problem with the upcoming marriage existed, someone in the parish would probably know about it! But today, since people tend to be more mobile, the effectiveness of marriage banns is correspondingly lessened. If a prospective husband or wife has only lived in the diocese for a couple of years, having moved here to take a job after finishing university (say), the chances that anyone else in the parish will be aware of issues regarding the marriage are extremely slim. At the same time, since so many people of marriageable age today tend to be involved in the social-media world, it might be easier for a parish priest to figure out if a hidden problem exists simply by doing an internet search! Nevertheless, since the situation in different parts of the world may vary dramatically, it’s still possible for a particular Episcopal Conference to continue requiring marriage banns if the bishops feel it is genuinely useful. And so the various Episcopal Conferences have proceeded to enact appropriate rules for their respective territories. In Canada, for example, the Canadian Conference of Catholic Bishops has declared that the publication of marriage banns is no longer obligatory—but banns may be published if the parties request it, or if a diocese’s own regulations recommend it. This means that an individual Canadian bishop can still require the banns to be published in his diocese, if he considers it appropriate. Otherwise, the pre-marriage investigation required by canon 1066, and carried out by the parish priest, is considered sufficient to establish the freedom of the parties to marry in the Church in Canada. To cite another example, Scotland’s Bishops’ Conference has abrogated all previously existing local laws requiring the publication of marriage banns. Instead, the local bishop is now to establish the precise pre-nuptial preparations that are to be required in his diocese, and these must be followed. There may, therefore, be significant variations in the overall procedures used by different dioceses in Scotland. 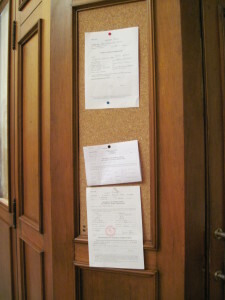 Here in the diocese of Rome, however, the publication of marriage banns is still obligatory. Instead of reading them from the pulpit at Sunday Mass as was required by the 1917 code, they must be posted in a prominent place near the door of the parish church for a set period of time (as in this photo from a typical Rome parish), so that all who come into the church can easily see them. So now we have the answer to Brian’s question. The publication of marriage banns has traditionally served an important purpose, as it helped to establish the canonical freedom of a prospective bride and groom to marry; but these days its effectiveness has diminished in many areas, so the Church no longer requires it across the board. In some parts of the world one may still encounter the practice, while in others it is nowhere to be found. Regardless, the obligation of pastors to determine up-front that no impediment exists that would prevent two people from marrying validly in the Church still exists! But the Church recognizes that just as there are many cultural and societal variations among Catholics around the globe, there are also different methods of carrying out a prenuptial investigation, and it lets the Episcopal Conferences of different regions make the final call. This entry was posted in Marriage, Parish Life and tagged banns, canon law, Catholic, marriage. Bookmark the permalink.